Sometimes composing an image is a series of compromises. 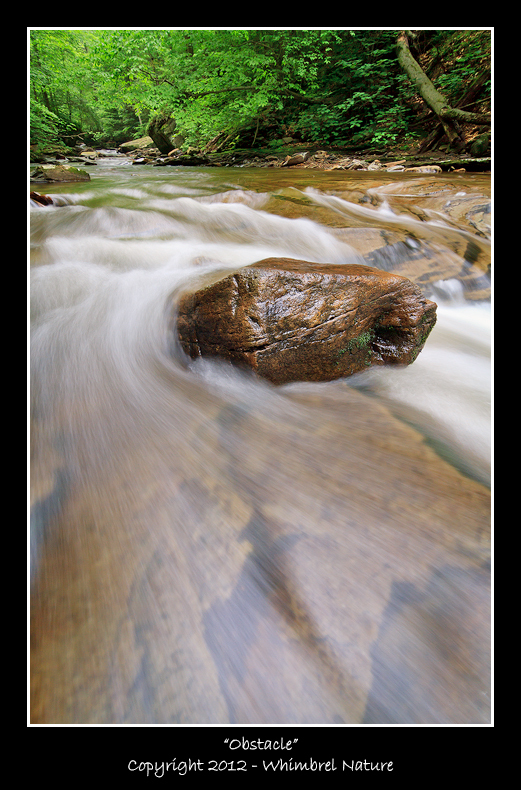 In the image above, "Obstacle", I really didn't want to put the rock so close to the center of the frame. I tried moving closer and recomposing with the rock in the immediate foreground, but then I lost most of the flow of water around the rock and the interesting patterning in the shelf of rock that made up the stream bed. These were the features that drew me to the scene in the first place and really made the photograph. From this vantage point, however, I couldn't tilt the lens any further upward without including washed-out white sky or any further downward without losing the nice green forest at the top of the image and including my tripod legs in the composition. So the rock had to stay where it was. Sometimes you have to let go of the "composition rules", or your own preconceived notions of the composition, and work with what nature gives you. Don't sacrifice elements that drew you to the scene, at least not without careful thought, to satisfy some notion of what you think the composition "should" be. Otherwise you may end up with a "perfect" composition of a totally uninspiring subject. This composition works very well for my tastes. I like to bend the rules of composition when I feel it is needed. Elijah, I always enjoy your wonderful Thursday tips. Your words are so very true. Sometimes I just ignore those "composition rules" to create the capture I find most pleasing. Love the tip, love the pic!